The latest wave from Hasbro includes four new figures, and no regurgitations of any main characters. Halleluiah! 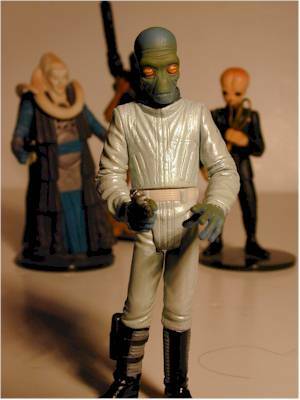 This time we get two Cantina aliens, Ellorrs Madak and Ketwol, the generic Bespin Guard, and the only Episode 1 figure, Sabe. 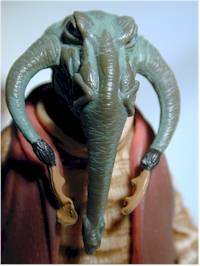 She's the decoy for Queen Amidala. Been there, done that. But I won't say anything bad about the Force File cards this time! I can't fault them on this wave! 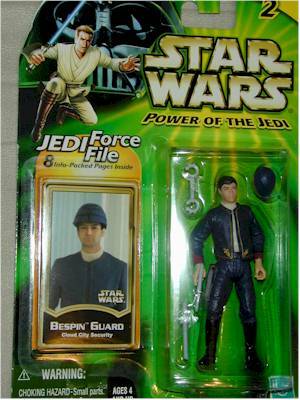 The Bespin Guard really looks like the actor - check it out on the Force File card if you don't believe me! Ketwol and Madak are simply great, with all kinds of excellent detail in both the head and body sculpts. And even Sabe, who many will think is the least exciting of this wave, is a terrific sculpt. Another thing that never hurts - all the figures stand fine on their own, and nobody has a bizarre body sculpt. 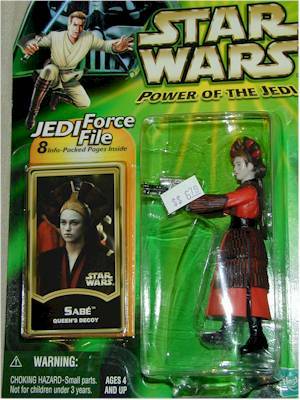 Sabe's arms are sculpted to hold the blaster in front of her two handed, but it's at least a reasonable pose. The nicest touch here is the sculpted holster on the calf of Madak. The blaster fits, and looks great. It's Hasbro. But it's Hasbro getting better. 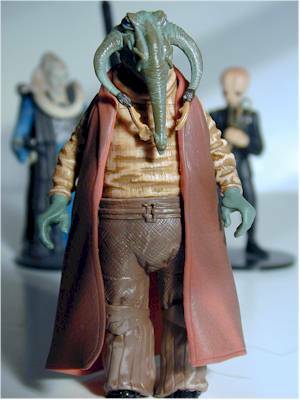 The Bespin Guard is the best, with neck, shoulder, hips, waist and cut joints at both elbows. Ketwol is decent, with neck, shoulders, waist and hips. Cut joints on his arms would have been nice, or something else with his legs. Madak is slightly posed, but it's a good pose, and he has neck, shoulder, hips and waist. Cut joints on the arms would have been nice here too, but he still stands and poses well. Sabe is decent as well, with neck, shoulders, hips and waist. Nothing stupendous, but all are at least serviceable. Hasbro gets points this time for at least including some sort of accessory with every figure. Madak has his blaster as does Sabe, and the Bespin Guard is seriously outfited with a removable cape, cuffs, blaster and club. But the winner of unusual accessory of the year is Ketwol, with his removable pants. You see, Ketwol has really short little stubby legs. So to be big and imposing, he wears stilts. These stilts are part of his sculpt, and he comes with a pair of rubbery pants that go on over his stilts quite easily and look great. And I won't say a single negative thing about the Force File cards! The paint ops on all four figures is terrific. The eyes on Ketwol and Madak are excellent (although some Madak's are coming without the lines painted in), and the wash on Ketwol's uniform works for a change. 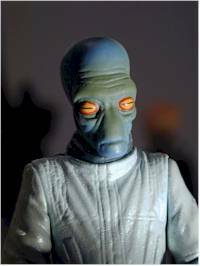 The details, such as pupils and eyebrows, on Sabe and the Bespin Guard are perfect, and overall the paint colors are bright and attractive. I wish I'd picked these up at Wal-mart for $6, but even at the Target price of $7 they were worth it. For me, this is one of the best waves in quite some time. Having two aliens, even second rate, spliced-in-as-an-after-thought aliens, makes this wave special, but the great work on Sabe and the Bespin Guard rounds it out exceptionally well. Wal-mart if you can - Target is getting them by the caseload as well though.